Purpose: This study aims to discuss a framework to promote ambidexterity through an intentional managed enabling context in order to develop university lecturers’ competencies and, at last, to improve students’ skills. Design/methodology: A descriptive case study was performed based on literature review and the data collection was done through documentary and field participative research with the PACT working group. The paper reports the stage and maturity of the High Commonality of Themes Project (PACT) on a private Brazilian university in Rio de Janeiro. Consequently, since the faculty shares more qualified knowledge and the syllabus could be realigned without losing epistemological identity, the subjects expect that the students learning process performs on market demanded pragmatic and practical skills. Findings: Findings indicate PACT as a kind of improvement, since it makes possible, balancing Refined Interpolation with Disciplined Extrapolation, to promote the ambidextrous learning through an enabling context, thus allowing specialized lecturers to improve competencies in their core area. Research limitations/implications: As a case study, findings could not be widespread and limitations are related to the initial stages of the PACT implementation. Originality/value: The value and originality of the ambidexterity approach refer to the possibilities it could overlap the bottlenecks that faculty performance generates to students learning effectiveness: non-adherence by the faculty to the discipline they teach (Human Capital); way lecturers interact among courses and one another (Social/Relationship Capital); and development and practicality of the educational guidelines of the course – PPC (Structural Capital). The transformations in the educational process promoted by higher education institutions (HEI) in Brazil have two outstanding features: "privatization and institutional fragmentation" (Cunha, 2003, pp. 185). Over the years, the high market demand for qualified work force and some government incentives on the high education industry led to the participation of new social actors - mainly market players - and to the improvement of the presence of the institutional investors in this industry. •what skills, certificates and academic degrees should be required from those who choose to work as HEI lecturers. There is no consensus on the answers to such questions: for the Brazilian HEI, there were not significant interdependence relations between the lecturers’ academic degrees and the students’ assessment scores established by the Ministry of Education and Culture (MEC), such as the National Exam of Student Performance - ENADE (Nicolini, Torres, Macedo & Câmara, 2014). Therefore, some HEI show resistance in hiring professionals without such certificates and degrees to join their faculty, since it directly influences the metrics used by the MEC to evaluate the intrinsic quality of the courses. So, it is possible to see in practice the policy of "the evolution of the faculty qualification in higher education institutions as requisite to the quality of what is offered" (MEC, 2014). Master and PhD professors are hired by HEI, most of the time, "not only to communicate matters, but rather to discuss wisdom as experts in the art of conveying, forming and creating knowledge" (Czeczko, 2009, pp. 4). However, the practice of the HEI - especially the private ones - raises concern since professors are allocated to disciplines that are non-adherent to their prior professional development, thus these lecturers get in the classroom to discuss subjects they do not really dominate. Among the reasons that explain this fact there is the faculty’s working contract. In Brazil, there are not tenure rights and private HEI has lecturers whose wage is set according to the amount of time they are in the classroom. And, "reducing the lecturers’ working journey is only permissible because of the decrease in the number of classes, fact that does not depend on the employer's own will" (Bento & Padilha, 2005, pp. 9). Therefore, course coordinators need to gauge the lecturers’ working journey every new semester in order to avoid labor issues - observing high or low demand for each discipline offered on each syllabus. Thus, sometimes HEI stop focusing on the lecturers’ adherence to the disciplines they will teach in order to fill the working journey, for example, from HR Management to Cost Analysis classes. On the other hand, at the government universities, there is a career plan for the lecturers, based on degree achievements on long term progressive mechanisms, including meritocracy - but, not exactly, goal seeking. The intent of this paper is focused not on the discussion of the faculty working journey or on the dichotomies "abstract versus practical or knowledge versus skill" (Khan, 2013, pp. 75). Instead, it concerns about a scenario that, as a whole, generates constraints both for the development of teaching competencies and to the educational process. So, the research question explores the adherence of the ambidexterity approach - activating capacities and potentialities from both brain hemispheres - to improve Business Management faculty’s competencies and performance on teaching and mentoring, mainly the social and behavioral ones, based on the realignment of the lecturers’ enabling context. •the identification of congruent and dissonant points among theories about the enabling contexts, the ambidextrous learning and the PACT framework. As a case study, this paper reports an innovative action that is being implemented in an undergraduate Business Management (BM) course at a private HEI located in Rio de Janeiro - Brazil. This initiative seeks to improve of the Human dimension of Intellectual Capital by the development of the enabling context - knowledge sharing environments - through ambidextrous learning - both brain hemispheres -, based on the exploitation-exploration model - innovation practices - that states that could be better to be prepared to explore conjointly new possibilities (exploration) than just only to exploit old certainties (exploitation) (Schumpeter, 1934; Holland, 1975; Kuran, 1988; Prieto-Pastor & Martin-Perez, 2015). It is important to note that the "Human Capital" has become increasingly important as a result of works done from the perspective of Chicago School, which aims to identify, among other things, composition, inherently-legacy, acquisition, accumulation, interchangeability and income - being linked to the educational processes as an investment that would enable the expansion of productivity, from the perspective of organizations, and income generation, from the perspective of the employee. In general, under the Human Capital educator lenses - lecturers - a university degree in management would enable, ultimately, the transfer of knowledge that allows students deciphering, through enhancement of entrepreneurship and managerialism, the consumption-society investment mediated by the market (Costa, 2009). the current study, similarly to that by Kang and Snell (2009), takes into consideration the possibility inherent to the contextual ambidexterity because it seems to be able to provide, at the same time, the mentoring insights and the teaching artefacts. By keeping in mind that the Intellectual Capital has three dimensions that are intertwining on the value creation (Stewart, 1999) - Human, Relational/Social and Structural Capital - the reported case involves the adherence of the faculty to the syllabus they teach, the way the different syllabus share the disciplines and the development and practicality of the educational guidelines of the course (PPC). The transition to the knowledge era raised the contradiction from something “dumb to be avoided” - the Human Capital - to something to be cultivated within organizations. Towards the higher education scenario, lecturers - as core knowledge workers - are assigned to the task of developing new ideas and processes, by identifying, capturing, distributing, sharing and encouraging knowledge development. Therefore, it implies adopting practices consistent with individual and organizational knowledge creation and learning processes (Ponchirolli, 2007). However, the inconsistencies, polarities, dichotomies and oppositions related to knowledge creation should not be considered improper, since it is formed by two complementary components: the tacit and the explicit knowledge (Takeuchi & Nonaka, 2008, pp. 19). Sveiby (1998) highlights that the practical knowledge is largely tacit, i.e., at this point knowledge does not allow encoding and it is difficult to share, fact that makes the process of discussing knowledge even more complex. Moreover, as Polanyi (1967) states, tacit knowledge is personal and not transferable, it is specific to the context and, therefore, difficult to formulate and communicate. As described by Choo (1998), it refers to that knowledge used by the members in the organization to do their work and give meaning to their worlds. In short, it can be said that tacit knowledge is internalized by the individual in a unique and personal way; therefore, it is not very easily articulated. By the way, it results from individual configurations done through data provided by the environment the individual is inserted in, thus it is "almost impossible for two or more people to develop the same knowledge when they receive the same information" (Setzer, 1999). That is why such issue should be carefully treated when discussing the learning processes, hence the focus of this study. Takeuchi and Nonaka (2008) believe that the explicit or codified knowledge - which refers to the knowledge transmitted through systematic and formal language - only exists in, lies on and is created by individuals. The explicit knowledge may be embedded, but its construction takes place only when this individual interacts within a certain community. Thus, the explicit knowledge can be expressed in words, numbers or even sounds that are often shared as data, manuals, audio-visual and scientific formulas. In this sense, developing knowledge means expanding artifacts created by a group of individuals within organizations. This is what Von Krogh, Ichijo and Nonaka (2001) call "enabling context" or "facilitating conditions". According to their view, the meaning of the word “management” in association with the word “knowledge” should not be understood as a synonymous for control. Regarding the academic perspective, the enabling context is composed of cooperative style, of networking activities, of team building and of the support given to learning schemes such as mentoring and coaching (learning relationship that takes place when a more experienced professional takes the mentor/coach position and shares knowledge with the fresh player). These features promote an environment where ideas are naturally created, since knowledge is essentially related to human actions and its development process depends on the participants and on the action they take (Von Krogh et al., 2001). Lima, Melo, Faustino, Braga Filho and Silva (2011) emphasize that the human component is directly linked to the development of organizational knowledge and that a favorable environment may potentiate the emergence of such knowledge. In other words, the organizational atmosphere influences the enabling context and it increases the possibility of sharing knowledge. So, enabling contexts are relevant as a core driver to contemporary organizational strategy and they must to be designed and dimensioned, in a proper management artefact, to effectively support meaning and value creation (Lopes, Fontes Filho & Rezende, 2014). According to Choo (1998), from beyond the tacit and explicit dimensions, there is a cultural one, consisting of affective and cognitive structures used by the members in the organization to explain, assess, understand and build reality. Therefore, it includes beliefs and assumptions used to describe and explain reality; thus, it cannot be encoded, although it is disseminated through the relationship levels connecting the group members to one another. 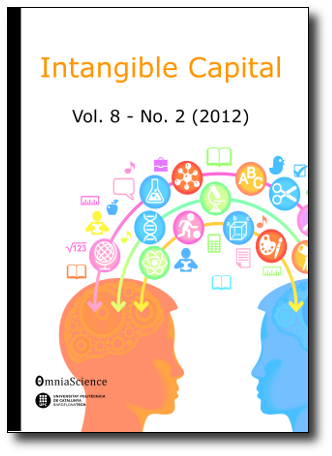 Thus, due to the complexity of the knowledge transmission process that contemplates the learning process, and the requirements and facilitators from the enabling contexts for ambidexterity, this study used the Intellectual Capital (IC) taxonomy in three dimensions, as it was done by Stewart (1999), since it is one of the most accepted bases for studying the intangible assets and their impact on the value creation (Table 1). It consists of all or almost all knowledge held by the individuals within an organization. Their previous experiences, education, teamwork, ease of learning and individual expertise. It also includes creativity and, consequently, innovation capacity (Edvinsson & Malone, 1998). This capital grows when organizations take possession of knowledge coming from people and when they are interested in knowledge that is relative and contextualized to organizations. Human capital consists of people who make the difference within the organization, i.e., those whose talent and roles are virtually irreplaceable (Stewart, 1999; Edvinsson, 2003; Edvinsson & Malone, 1998). It is based on resources external to the organization, such as trade capacity, relationship with suppliers, financial institutions, customers, research centers and investors. This kind of capital aims to ensure the organization faithfulness, transparency and image. These relationships may be measured by indices such as satisfaction, longevity, sensitivity to prices and others (Edvinsson & Malone, 1998). Processes capital: composed of standards, rules and procedures focused on increasing production efficiency. It consists of internal processes, database, operating systems, routines, Information and Communication Technologies adoption and organizational learning capacities. Innovation capital: the organization’s capacity to renew itself as well as the results from innovations such as patents, for instance. According to Faste (1994), the meaning of "ambidextrous thinking" encompasses possibilities inherent to the proficient use of both hands in performing an activity and, by extension, the use of the whole body and even the mind - leading to wider possibilities linked to synesthesia as a way of learning -, i.e., resorting not only to the symbolic level but also, and mainly, to the sensory level - and also those inherent to recognizing the importance of the brain hemispheres and modes as basis for decision making (Kahneman, 2012). The judgement and decision making process represents the essence and the excellence of the role played by the managers in the Neuroeconomics (Rocha & Rocha, 2011). Markides (2007) identifies the didactic-pedagogic and conceptual distance between lecturers focused on the practice and those focused on the theory. According to BM students, it creates “pedagogical noise” regarding the academic unit of the undergraduate course. As for an equivalent point of view, Bartunek (2014) discusses the need for "pracademics" in teaching and in the final delivered product from BM higher education. It would be achieved by developing an ambidextrous mental model, able to mediate and bring together logics and boundaries that delimitate the academic and the corporate worlds, which are, at first exclusionary (Panda, 2014). Scientific rationality and instrumental rationality would need to be reviewed and realigned in order to get better results in the professional education of Business Managers (from simple training courses to post-doctoral activities, specifically passing by baccalaureate) and allow generating and improving theories that fit into practitioners’ daily needs (Sandberg & Tsoukas, 2011). The inability to deal with the increasing gaps between knowledge produced in universities and that actually needed have the organizations managed could be blocking the research agenda with discussions on relevance and rigor, when, in fact, it should focus on debating relevance and applicability (Markides, 2011). •does not deal very well with restrictions, limitations and frustrations (Lombardia, Stein & Pin, 2008). The ambidextrous thinking concept applied to education may go beyond the application of didactic and pedagogical practices in the operational context. It must strategically reach the way and the process from which new projects are developed within the education sector. The ambidextrous perspective would allow escaping the HEI’s traditional logic of industry positioning and “operational efficiency planning” by providing the institution with good conditions to innovate through exploration and exploitation, alternately. HEI would find in the ambidextrous thinking settled between managers and educators an effective tool to survive in times of great transformations in students’ profile by communicating with them and with the prospects through guidance based on customer relationship management (CRM) (Zuo, Li & Pan, 2014), and, more than this, forecasting the opportunities that will come from the internet of things (IOT). Nevertheless, the CRM “agenda” is a controversial issue in the daily discussion about the strategies developed by HEI. It is almost evident that the ambidextrous organizations would need ambidextrous senior managers, or at least a management model based on an internal convention that guides and creates acceptance to the dualities of thoughts and decisions from the two basic brain modes (Tushman & O'reilly, 1996). The organizations would need to unify and align the expectations and tensions naturally existing within the respective task environment in order to achieve success from ambidexterity (Raisch & Birkinshaw, 2008). Thus, it is necessary to go beyond the idea that universities would be able to effectively and harmoniously share the different knowledge fields to better understand them and make them available through specialization. The unit of knowledge, at the extent and consilient way disseminated by Wilson (1999), is daily challenged by universities through prevailing fragmentation. Instead of bringing the social actors close to reality, the universities turns out to separate them, as it does when fragments knowledge. HEI should adopt dynamics capable of integrating linear and holistic thinking as management praxis and as pedagogical and didactic model, thus making ambidexterity, rather than a permanent practice, a way to understand completeness itself (Meeker, 1975). According to Yamaoka, Carvalho and Gauthier (2012), ambidexterity would result from an integrated set of procedures related to the knowledge management, innovation, learning and competencies that would compose the taxonomy of contents needed to develop the strategies and operations within an organization - whether they are settled and/or under construction, in use or stored, under the control of the entity or not. As highlighted by Kurtz and Varvakis (2013), the experience of mentality and dynamics based on organizational ambidexterity would enable creating richness in contexts of turbulence and technological breakthroughs, since it would enable strategic reorientations in the short term with long-term effects. Therefore, this would be an extremely useful capability, which should be studied in depth and learned as subject to exercise management. The interactions between the exploitation and exploration approaches formulated by March (1991) consider two basic proposals: the first deals with the use of the knowledge that is in place within the organization, i.e., applying the framework that the organization already has; the second one considers the possibility of "exploring new horizons" by expanding knowledge beyond the organizational boundaries. By considering the three dimensions comprising the Intellectual Capital, exploration sees the professional group as generalist, since should be able to work in a multiplicity of fields based on the complementarity of individual competences. On the exploration mode, the liaisons with other organizations and/or areas (Relationship Capital) follows an entrepreneurial perspective, i.e., more individualistic, more "closed". So, the Organizational Capital needs to be flexible to the extent that the group is willing to open the organization to the environment. On the other hand, exploitation means reuse, i.e., the intensive adoption of the knowledge already obtained and detained. Thus, in this case, the preferred professional group is the specialist, who knows a specific subject in a deep way. Furthermore, it is believed that cooperativism will allow sharing the specialists’ knowledge to do similar things. However, it requires more control from each part of the processes and that is why the mechanistic system is mentioned as its representative. Ambidextrous organizations are able to share the concept of exploitation and exploration that improves the fit of their internal needs and business environment conditions. Kang and Snell (2009) developed two Intellectual Capital and ambidextrous learning conceptual constructs that formed the basis for the current investigation; they take under consideration the Intellectual Capital dimensions as Human, Social (Relationship) and Organizational (Structural), as suggested by Stewart (1999), and establish classifications based on previous studies. Thus, they objectively identify the features found in the exploitation and exploration models and then merge the proposals, as shown in Figure 1. The created constructs are called Refined Interpolation and Disciplined Extrapolation. In Refined Interpolation, the work is developed by specialists in certain subjects who share their knowledge in the form of cooperative through a more flexible organic structure, as suggested by Burns and Stalker (1961). On the other hand, Disciplined Extrapolation counts on generalist people who have more superficial but broad knowledge, and who act according to the organization’s logic, but with clear and standardized rules. The institutional landscape of higher education organizations in Brazil is marked by controversies and resilience. If, from the historical point of view, there was an explicit prohibition of Portugal to the installation of such organizations in colonial Brazil – giving rise to a notary vision for operation of the HEI - today there are dozens of small-sized private organizations that account for approximately a third of the students enrolled, accentuating a heterogeneous and uncoordinated supply of courses and programs (Cunha, 2003). From the investment point of view, the unplanned expansion led to the concurrent offer of chairs with equivalent content in various units and departments of the same institution, undermining the allocation of tangible and intangible assets. Access to higher education and its engagement process comes from the previous participation of the applicant candidate in high school, whose parameters are regulated in the National Curriculum Guidelines for Secondary Education - DCNEM (Brasil, 2012). From the entering and participating with success in higher education, the student may be taken on its academic background both from lato sensu or stricto sensu graduate studies (Figure 2). •the understanding of scientific and technological foundations of the productive processes, relating theory with practice. •the technologists are titles of specialized training in scientific and technological areas, which offer, to graduate, competence to act in specific professional areas. •to develop the high management and assimilation of new information presenting intellectual flexibility and adaptability contextualized in dealing with several current or emerging situations in the various segments of the administrator of the field. The skills provided for those attending undergraduate courses in BM are listed in Appendix I. Concerning about graduation courses, the perfectioning and specialization courses aimed at the improvement of technical specific professional skills in specific sectors without focus, a wider and more critically a certain body of knowledge; already the master's and doctoral courses are oriented towards the research and the scientific basis of practices and artifacts to the "application of a technique or practice a profession". While perfectioning and specialization courses provide certificates of proficiency or expertise, master's and doctoral courses confer degrees within an academic hierarchy (Brasil, 1965). Graduation has always been seen as a renewal generating engine within HEI. Thus, the controversy regarding the mandatory academic degree of the lecturers was not generated by chance. In addition, graduation is responsible for creating "the evolution through which there is the extension of the higher education functions from its traditional functions - to promote and enhance knowledge through research and transmit it by teaching" (Bireaud, 1995, pp. 22). It is only possible through research and extension carried out within these HEI. •ensure the formation of high standard intellectual groups to meet the national development needs in all sectors. (Cunha, 2003, pp. 185). It is worth emphasizing that the Federal Magisterium Statute was established to regulate the university teaching profession at government universities and create new steps for professors’ qualification, so that "graduation and research, articulated with the university teaching career, would produce a qualitative change in university education" (Cunha, 2003, pp. 188). In fact, shortly after this enactment, in 1969, there was greater flexibility for those who wanted to keep their jobs, but "the requirement for master and doctoral graduation remained, whether as restrictive condition or as wage incentive" (Cunha, 2003, pp. 186). Despite the university teaching reform laws, it is easy to see that "having high-level training and excellent individual skills is not enough to be a reflecting professional, especially as a lecturer; HEIs are full of scholars who cannot teach and that do not question themselves regarding this aspect" (Perrenoud, 2002, pp. 170). Therefore, regarding HEI, there has always been a constant struggle between two different streams of thought. On the one hand, there are those who believe that education should, above all, be practical and designed to give students the skills and information they need to make a living. On the other hand, there are those who feel that the search for knowledge is an enhancement process that deserves to be lived on its own merits (Khan, 2013, pp. 73). •learn in practice how to use knowledge in the labor market, thus pointing out the most suitable way - for students who seek knowledge - to be successful in their chosen profession. (...) the harmonious combination of technique and correct compliance with the quality indicators issued by CAPES (the Brazilian government agency, in charge of evaluating graduate programs to evaluate Graduation Programs), thus structuring their proper functioning, intellectual production and scientific expression (Czeczko, 2009, pp. 4). This was the main factor that led to the attempt of effectively changing the lecturer competencies development in the Brazilian HEI. Stricto sensu graduation (masters or doctorate) are courses focused on professor and researcher training anywhere in the world, but "there are very rare cases in which the pedagogical preparation to teach in higher education is required on a compulsory basis" (Bireaud, 1995, pp. 186). There is a gap in the syllabus of stricto sensu graduation courses, since didactics - which is fundamental to teachers from any knowledge field or level - is apparently relegated to the background when one thinks about the priorities that should be included in the courses’ mandatory curriculum, fact that tends to generate a number of inconveniences to the educational process. The Law of Foundations and Guidelines National Education (LDBE) has been first mentioned in the 1934 Brazilian Constitution, but it was only implemented in 1961. The LDBE was subjected to a redesign process ten years later, so that its last version was promulgated in 1996 and came to reaffirm what was proposed in the 1988 Brazilian Constitution: to enforce the principle of indissociability among education, research and extension activities. This late version established that one third of HEI lecturers must have graduation degrees and that the same proportion of the faculty should work full-time. The current research has a peculiar exploratory character: on November 2014, no other study on the ambidextrous learning in HEI’s task environment or on the architecture proposed in this socio-economic type of organization - industry - was identified at Scopus and Emerald databases. Therefore, this is a new field to be explored. In addition, the current study sought to describe the field to be studied, fact that makes it a descriptive approach. The chosen methodology was the case study, which subject matter was the High Commonality of Themes Project (PACT) on implementation by a private HEI located in Rio de Janeiro - Brazil. Data collection included field and documentary research. In addition, direct participant observation coupled with preliminary interviews and focus groups, made during the second semester of 2014, allowed indiciary evidence of the observed reality (Ginzburg, 1989). The HEI have asked not to mention individuals or their specific opinions along the case description, since PACT is a collective effort. André (2005) argues that case study always involve a contextualized instance/entity in action and attend to four essences characteristics on research in the areas of Applied Social Sciences and Humanities: particularity, description, heuristics and induction. The reason why PACT case was chosen as an illustrative case study is the comprehensive approach that follows the model precepts disseminated by March (1991) focused on the ambidextrous learning: exploitation and exploration. While qualification process of future professionals who exercise managerial functions, PACT seeks to develop in the classroom and beyond, capabilities that integrate reason and intuition. In this sense, lecturers are also defendants to take on new methods and postures including a new mental model and pedagogical approach that stands out the "refined interpolation." Most of all, coordination staff must be ambidextrous persons. These issues align the PPC with the institutional corporate strategy, where stands the strategic intention to "go beyond the classroom", attempting to be an ambidextrous organization. The HEI where PACT has been implemented is more than four decades old, has more than 40 courses, decentralized in Rio de Janeiro on more than 10 campi with 28.000 students assigned - most of them born in the mid-1990s, clearly constituting the Generation Y. The HEI starts as a family business, in a small scale operation, and is going to professionalization once achieves a complex and repercussion business model. The socio-economic profile of the students corresponds to the C and D classes, respectively, from the Brazilian economy point-of-view, low-medium class and recently income-improved families, most of all living at the metropolitan area of the city of Rio de Janeiro - suburban and exurban. The HEI also runs three doctorate programs, five master programs and a large portfolio of specialization and non-academic short duration courses. PACT has been implemented as a pilot project since the second semester of 2013, on the BM bachelor's program and, nowadays, holds six classes and 18 teachers on a pilot project located at campus Lapa, in the city of Rio de Janeiro, on downtown. Its full implementation in the BM courses is being planned for six undergraduate courses as a whole. The project development followed the roadmap shown in Figure 3. In a broad sense, the coordination awareness among alignment and performance seems that was raised and, along with the coordinators, the lecturers established the thematic semesters according to the skills that met MEC requirements and, then, they thought about the semesters and modules that could be shared. Brazilians HEI, especially the universities kind ones, have autonomy to offer new courses; therefore, the proposals tend to have similar or even equal basis depending on expertise of the faculty. For instance, when the university has expertise in management, it can offer bachelor's degree programs in BM. According to this scenario, it is possible to have several courses sharing lecturers, subjects and/or classes. However, in most cases, the way this sharing happens in practice seeks to optimize the use of resources, without spending too much time worrying about keeping the identity of each course or the quality offered. These challenges, which are apparently dichotomous and incompatible, encouraged the proposition of PACT based on the scientific, technological and innovation knowledge generated by educational management researchers. For the PACT’s coordination, even facing shared resources the main assumption consists of providing the competencies each course is expected to develop in the students. However, it is believed that learning should not be focused on the discipline and its contents, but on the set of knowledge, skills and attitudes that form the goal competency to be developed. Thus, management transversal skills - and central themes - should be shared, such as organization, processes, human resources, marketing, finance and operations. Therefore, the syllabus needed to be organized so that the contents complement one another and learning is continuous - balancing focus and peripheral vision (Day & Schoemaker, 2006) to include the new development on each discipline contents. The solution was aligned from thematic semesters dedicated to core competencies, as shown in Figure 4, which represents the BM course syllabus: it takes eight semesters to complete the course, every semester approaches a thematic module, for instance, marketing skills, and all disciplines help producing a common core. Thus, the schedule of course has no prerequisites and each module is designed based on the revised Bloom’s taxonomy of thinking skills (Anderson & Krathwohl, 2001). The two final modules emphasize practicalities than theories, to improve the focus on the more complex and desired thinking skills on Business Management: analyze, evaluate and create. Although some internal voices remain skeptical about the PACT project - especially because they understand that some contents should constitute prerequisites for others -, the coordination approaches the fact as if temporality can be measured by weeks instead of semesters: organizing the content on week basis with the participation of the lecturers allocated to the subjects allows avoiding this dilemma, as well as treating similar contents in different disciplines, thus avoiding recompilations that do not add value. From the PACT’s “situation room” understanding, the new approach make the courses able to share building blocks, and not just subjects or lecturers, without losing their identity - because certain thematic skills are shared by technologists and bachelor's degree courses. As an assumption, the coordination perspective and performance becomes aligned and the lecturers act in the field in which they are primarily competent. In addition, according to this configuration, the lecturer has the sense of belonging to the HEI, and not to a specific course. This position even makes it easier to see the possibility of new courses depending on the range of offered competencies and the multiple possible combinations. It is worth mentioning that the amount of studying hours required for each course were taken under consideration and lecturers that adhered to the subjects of each theme were selected to take part in the semesters’ scheduling. Both for the PACT’s leaders and HEI lecturers, the faculty was a key piece in this process, which started from competency (the core theme) and passed through the content of each discipline (even the Programmatic Units - transversal to the disciplines of the semester). So far, the PACT framework has already shown as a positive result the working group climate and goal seeking, that is composed of specialist lecturers who have substantially contributed to the development of all the material and to its implementation. The working group is formed by lecturers from several courses. Meetings and encounters are promoted to adjust the classroom speech and practices to the extent that the material from all the disciplines becomes accessible to all lecturers. Suggestions for expanding the possibilities inherent in the teaching-learning process are encouraged from the exchange of materials and use of shared contents, processes and pedagogic resources available in “cloud libraries”. As it was reported by the coordination, the disciplines are gaining more identity, and the classes, whether they have students from different courses or not, have a common goal that focus on competency rather than on content subjects. The findings from the field research led to only three out of the 176 teachers has been working as specialists. This fact implicates on a more accurate analysis and, after evaluating the syllabus, it was possible to identify the faculty core themes and realize that many of the lecturers were working as generalists - thus, certain disciplines lost their identity or pattern - or even focusing on the theory, since they did not have practical knowledge on the contents to work as "pracademics", as it was suggested by Bartunek (2014). As for the Human Capital, the specialist lecturer is considered the one who teaches disciplines from a single field, and the generalist works in more than one knowledge field. This situation was observed when surveying lecturers in the faculty and comparing the subjects they were allocated to. Still, the difficulty in including practical daily base activities in the classroom brings out some more complex obstacles that deserve attention, especially when the Generation Y - which nowadays represents the largest contingent of students - is taken under consideration. As mentioned by Lombardia et al. (2008), despite the fact that they tend to tend to prefer results in short-term and do not know how to cope with restrictions, they are familiars to breakthroughs and are more creators than receivers. Therefore, teaching methodologies are being revised and the active methodologies, such as those bolded at the PACT, are gaining space, fact that proves the importance of praxis in educational processes. Regarding the Social Capital, most of the studied institution courses had been operating according to the cooperative mode, i.e., with lecturers interchanges. However, in practice, the feeling of belonging to a specific course led lecturers not to focus their classes on competencies, but on the faculty they belonged to. It is important to emphasize that a lecturer with background in Management and another one in Psychology can and should have different perceptions about certain content. However, the capabilities that must be developed in the class cannot rely on such interpretation difference. In addition, the interchange shows to be consistent with the proposal of realigning scientific and the instrumental rationalities according to practitioners’ needs, as it was reported by Sandberg and Tsoukas (2011), since the lecturer will work for the development of student competencies that are part of his/her expertise. Finally, considering Structural Capital, little flexibility was identified in the educational guidelines (PPC) in the HEI, fact that was hindering the progress of the PACT proposed activities. It was as if each course followed their own logic, so that sometimes lecturers felt disoriented in relation to standards and regulations, since they were working in more than one course. The PACT enabled the noticeable progress based on ambidexterity, by aligning and bringing together the existing expectations and tensions, as suggested by Raisch and Birkinshaw (2008), according to a consilient and non-fragmented PPC (Wilson, 1999) by integrating linear thinking and making ambidexterity a way to understand "completeness itself" (Meeker, 1975). Figure 5 presents some liaisons of the above Human, Social and Organizational Capital bottlenecks that exist at the operational scenario of private universities - denoting implications of no lecturers tenure, short term working contracts and variable teaching hours each semester - and the intertwining of Intellectual Capital architectures, ambidexterity and thinking skills development. Some implications were noticed in the undergraduate BM lecturers’ focus groups. Academically, it is possible to highlight the danger of allocating a lecturer who does not master the content to be presented. Students' perspective becomes deeper when the lecturer is a specialist because it enables constructive discussions that put the generalist teacher in delicate situations. Moreover, according to this framework, the lecturer him/herself is the one who likes studying and is always seeking to update and who turns learning into a rich process. On the other hand, the effective learning space is a consequence. This enabling context will make students, and even lecturers, more competent and prepared to work in the marketplace, since it provides the synesthesia mentioned by Faste (1994). Such synesthesia is a way of learning by dealing with sensory resources and not just the symbolic ones, fact that includes the tacit knowledge (personal and difficult to articulate) to the process, without losing the certainty that it complements the explicit knowledge and influences the way students perceive the world. As for the steering of the courses, the framework generated some initial discomfort due to the possibility of changes and to the fact that people were out their comfort zone, fact that bothers every human being. Some lecturers were even afraid of being dismissed, but this fear was then solved by making them aware of the PACT purposes and the results obtained until now. Bloom’s thinking skills development, from low level to the top, have been treated with the support of active learning methodologies, as problem solving and teaching cases, in search for resilient performance, both for lecturers and students. In a general way, since the contents from the same knowledge corpus are percolated at the same semester module, the learning process became consilient, but need to be supported by techniques that obligate the students to prepare the classes in advance. Figure 6 establishes the impacts on each IC dimensions under Refined Interpolation, and introduces the advantages of the PACT adoption in each situation. Far from seeking to generalize the scope of the covered concepts and findings related to the case study, and taking into account the intertwining threads of literature review, some additional aspects are likely to be explored from the follow propositions. •P1: The intentional management of enabling contexts allows the best value chain in the learning thinking skills development (Bloom & Krathwohl, 1956; Anderson & Krathwohl, 2001), from lower level to the top, and favors the creation of knowledge and innovation. Enabling contexts on management education were leveraged by information and communication technologies that make possible to articulate the perspectives from retrieving, recognizing, and recalling relevant knowledge to reunite topics in a holistic way, stablishing constructs, models or tolls. While the Refined Interpolation construct induces an environment where the common purposes and goals featured on the PACT’s PPC faces specialist lecturers sharing classroom contents, the ambidexterity offers a Disciplined Extrapolation alternative in a way to promote complex thinking at the last modules/semesters. •P2: The conversion of knowledge through the Socialization-Externalization-Combination-Internalization continuum (Nonaka & Konno, 1998) is leveraged by the ambidexterity, emphasizing holistic perception that is necessary to deal with, and have insights on, contents, relationships, models and artefacts from Business Sciences. The PACT social interactions among lecturers - mainly through faculty meetings and specialists focus groups on commonality themes - create a new institutional dynamic where capabilities being taught precede contents. So, the BM undergraduate course as a whole tend to be more market oriented, instead to be just academic oriented. While Refined Interpolation stimulates interchange rather than the encapsulation of individual views of the lecturers, the Disciplinated Extrapolation anchors syllabus objectives and lecturers’ working journey. •P3: The ambidextrous learning promotes a new environment around the tangible versus intangible dichotomy, favoring the “pracademic” unity of knowledge and the expansion of Intellectual Capital on the professional knowhow organization (Sveiby & Lloyd, 1987). As an employability consequence, the contemporary profile of the professional manager has to be at the same “beat” of the competitive environment: currently organizations compete more knowledge-based than directly through products and services. The ambidexterity mix between Refined Interpolation and Disciplined Extrapolation enables teaching out of the box at the PACT learning centered activities, because organic organizational capital supports the operation, for example, through blended learning that mixes class and on-line instruction. •P4: The Intellectual Capital (IC) dimensions management approach allows solving bottlenecks commonly present in HEI value chain processes, going beyond the operation efficiency or innovation double cross (Mesquita et al, 2014). Improving the coordination tool box at the PACT, from the industrial/tangible age to the service/intangible age, the evaluation of IC dimensions introduces metrics and initiatives to be planned that bold the value of the knowledge as the core of the HEI activities. There is a knowledge market and there are players and distribution channels far beyond the HEI. So, to guarantee the place of knowledge pioneers, the HEI have the imperative to innovate and to spill over contextualized and applicable knowledge. The ambidexterity - mainly on the contextual mode - produces exploration on the periphery of the science and exploitation on the center of the practices, avoiding, through PACT, pracademic myopia on BM undergraduate courses. •P5: From beyond Generation Y, structural ambidexterity and temporal cycling are not enough to solve behavioral tensions involving exploration and exploitation since there are dual characteristics acting at the same time at the learning process — design disruption and immediacy — that have to be solved by contextualized knowledge (Popadiuk, Franklin, Vidal, Miguel & Prieto, 2014). For a large portion of today's students, even education is now seen as a commodity of immediate consumption. The underlying question concerns the admission of these students in the labor market, since the absorbed knowledge in the undergraduate program should serve as a foundation for a solid career in the long run. In this sense, the educational opportunities inherent in Generation Y, for example, the ability to act as a network, should be maximized. Furthermore, the challenges, for example, little preparation to handle frustrations, need to be balanced by means of contextual counterweights, provided by ambidextrous lecturers, capable of generating innovation skills based on ambidexterity. This paper aimed to provide a way to promote the enabling context through ambidextrous learning in order to develop lecturers’ competencies. After specific literature review, the Themes High Commonality Project (PACT) was discussed, not in order to make it a unique framework to be followed, but to introduce and share this initiative and to discuss that it is possible to innovate on HEI by alternating exploration and exploitation. The choice of the investigation field was based on the constraints identified in the learning process at the HEI in face of the lecturers’ performance: non-adherence to the disciplines they teach (Human Capital bottleneck); the way school faculty is shared among courses (Relationship/Social Capital bottleneck); and the development and practicality of the educational guidelines of the course - PPC (Structural Capital bottleneck). Given this scenario, it was found that promoting the enabling context, as well as using ambidexterity, could change this reality. The PACT, which is adopted by a private university in Rio de Janeiro - Brazil, showed congruent aspects towards such concepts, especially regarding the infrastructure that serves the lecturer. In a way to overlap constraints, the PACT framework adopted the ambidextrous learning perspective, emphasizing Refined Interpolation in higher education management of pedagogical practices, but mantaining Disciplined Extrapolation as operational hedge. So, to face the Human Capital bottleneck, the faculty is being realigned to work more as specialists than generalists. To face the Social/Relationship bottleneck, the lecturers are reunited and motivated through a communality of themes approach. To solve the Structural Capital bottleneck, the PPC became more flexible and contemporary focusing on competences rather than in contents. With the solving of the three bottlenecks, over time, it is possible to achieve a more consistent pattern of teaching and learning with regard to social and emotional skills development needs - starting at the level of the lecturers to, subsequently, reach the level of the students. This issue is vital to face the Generation Y (and Z?) professionalization features that need to be better developed, for example, individualism, impatience and skepticism. However, it was noticed that the PACT operation depends on joint construction and on that done in parts. In other words, each instance must be involved at the right time so it can contribute and engage in this transformation project, mainly to achieve contextual ambidexterity - to work with exploitation and exploration at the same time. The findings of the framework advantages were evidenced to the extent that the learning model proposed in the PACT incorporates synesthesia and peripheral vision to its process, promotes space for lecturers to act as "pracademics" - by reviewing scientific and instrumental rationality —, and makes the guidelines of the PPC "consilient" rather than fragmented, thus turning the education system into an extremely useful societal capability. Still, there are some difficulties, including the formation of knowledge working teams, since there are not many specialists in the university, or even in specific fields of knowledge. In addition, there are those who teach as a self-compensation mechanism and not as profession for life, what always introduce some extra change avoidance. Some infrastructure needs have to be planned for the next years, since they involve investments to adapt classrooms to students-center learning architecture. Future investigation had to be implemented in a way to stress - focusing on the transformations produced by the PACT: student satisfaction, faculty organizational climate, performance measures operated by regulation agents (MEC), Intellectual Capital improvements, institutional reputation - as a driver to attract and to retain human talents - and labor market appreciation of the ambidexterity learning approach effects on the students’ careers. Nevertheless, it is worth emphasizing that the main limitation of the PACT framework is the fact that it requires a robust infrastructure. So that, a college, for instance, could not adopt it because it would lack resources. It is important to emphasize that further studies on this framework will be developed in order to exploit what has been done and to explore what more have to be done to face opportunities and adversities found in the PACT’s roadmap. André, M.E.D.A. (2005). Estudo de caso em pesquisa e avaliação educacional. Brasília: Liber Livro Editora. Anderson, L.W., & Krathwohl, D.R. (2001). A taxonomy for learning, teaching and assessing: A revision of Bloom's Taxonomy of educational objectives. New York: Longman. Bento, F., & Padilha, N.S. (2005). A relação de trabalho entre o professor e a instituição de ensino: Recordando os direitos especiais do professor empregado. Anais do Seminário do trabalho. Retrieved from: http://www.estudosdotrabalho.org/anais6seminariodotrabalho/fla viobentoenormasuelipadilha.pdf. (Last access date: September, 2015). Bireaud, A. (1995). Os métodos pedagógicos no ensino superior. Portugal: Porto editora. Bloom, B.S., & Krathwohl, D.R. (1956). Taxonomy of educational objectives: The classification of educational goals, by a committee of college and university examiners. Handbook 1: Cognitive domain. New York: Longman. Brasil (1965). Definição dos cursos de pós-graduação. Parecer nº 977/65, C.E.Su, aprov. em 3-12-65. Retrieved from: http://portal.mec.gov.br/cne/arquivos/pdf/2007/parecer%20cfe%20977-1965.pdf. (Last access date: September, 2015). Brasil (2005). Diretrizes Curriculares Nacionais do Curso de Graduação em Administração, bacharelado. Resolução CNE/CES 4/2005. Diário Oficial da União, Brasília, 19 de julho de 2005, Seção 1, p. 26. Retrieved from: http://portal.mec.gov.br/cne/arquivos/pdf/rces004_05.pdf. (Last access date: September, 2015). Brasil (2010). Referenciais Curriculares Nacionais dos Cursos de Bacharelado e Licenciatura/Secretaria de Educação Superior. Brasília: Ministério da Educação, Secretaria de Educação Superior. Brasil (2012). Diretrizes Curriculares Nacionais para o Ensino Médio. Resolução CNE/CEB 2/2012. Diário Oficial da União, Brasília, 31 de janeiro de 2012, Seção 1, p. 20. Retrieved from: http://pactoensinomedio.mec.gov.br/images/pdf/resolucao_ceb_002_30012012.pdf. (Last access date: September, 2015). Burns, L.R., & Stalker, G.M. (1961). The management of innovation. London: Tavistock. Holland, J.H. (1975). Adaptation in natural and artificial systems. Michingan: University of Michigan Press. Choo, C.W. (1998). The knowing organization: How organization use information for construct meaning, create knowledge and make decisions. New York: Oxford Press. Costa, S.S.G. (2009). Governamentalidade neoliberal, teoria do capital humano e empreendedorismo. Educação e realidade, 34(2), 171-186. Cunha, L.A. (2003). Ensino superior e universidade no Brasil. In E.M.T. Lopes, L.M.V. Faria Filho, & C. Greive. (Orgs. ), 500 anos de educação no Brasil (3. ed., pp. 151-204). Belo Horizonte: Autêntica. Day, G.S., & Schoemaker, P.H.H. (2006). Peripheral vision: Detecting the weak signals that will make or break your company. Boston: Harvard Business School Press. Edvinsson, L. (2003). Navegando pela economia do conhecimento. São Paulo: M. Books. Edvinsson, L., & Malone, M.S. (1998). Capital intelectual: Descobrindo o valor real de sua empresa pela identificação de seus valores internos. São Paulo: Makron Books. Faste, R.A. (1994). Ambidextrous Thinking. Innovations in Mechanical Engineering Curricula for the 1990s. New York: American Society of Mechanical Engineers. Ginzburg, C. (1989). Sinais: Raízes de um paradigma indiciário. In C. Ginzburg: Mitos, emblemas, sinais: Morfologia e história. São Paulo: Companhia das Letras. Kahneman, D. (2012). Rápido e devagar: Duas formas de pensar. Rio de Janeiro: Objetiva. Khan, S. (2013). Um mundo uma escola. Rio de Janeiro: Intrínseca. Kurtz, D.J., & Varvakis, D. (2013). Estudo das capacidades organizacionais sob a lente da ambidestria: Uma abordagem a partir do ponto de vista estratégico. Navus - Revista de Gestão e Tecnologia, 3(2), 152‑162. Lima, A.G.B., Melo, J.S.S., Faustino, J., Braga Filho, M.O., & Silva, S.T. (2011). Evidências do clima organizacional e do contexto capacitante na criação do conhecimento: Um estudo de caso em uma empresa pública de tecnologia da informação e comunicação. Revista Negócios em Projeção, 2, 27-42. Lombardia, P.G., Stein, G., & Pin, J.R. (2008). Politicas para dirigir a los nuevos profesionales – motivaciones y valores de la generacion Y. Documento de investigación. DI-753. Retrieved from: https://core.ac.uk/download/pdf/6536374.pdf. (Last access date: September, 2015). March, J.G. (1991). Exploration and Exploitation in Organizational Learning. Organization Science. 2(1), 71-87. Retrieved from: http://www.management.wharton.upenn.edu/pennings/documents/March_1991_exploration_exploitation.pdf. (Last access date: September, 2015). MEC – Ministério da Educação e Cultura. (2014). Paim destaca crescimento do número de mestres e doutores e defende qualidade. Retrieved from: http://portal.mec.gov.br/index.php?option=com_content&view=article&id=20779:paim-destaca-crescimento-do-numero-de-mestres-e-doutores-e-defende-qualidade&catid=212&Itemid=86. (Last access date: September, 2015). Meeker, J.W. (1975). Ambidextrous Education or: How Universities Can Come Unskewed and Learn to Live in the Wilderness. The North American Review, 260(2), 41-48. Nicolini, A.M., Torres, A.A.G., Macedo, P.C. de A., & Câmara, E.C. (2014). A correlação entre a quantidade de docentes mestres e doutores e o desempenho dos estudantes no ENADE: A realidade do Curso de Administração. Anais do Colóquio Internacional de Gestão Universitária – CIGU, Florianópolis, SC, Brasil, 14. Palfrey, J., & Gasser, U. (2008). Born digital: Understanding the first generation of digital natives. New York: Basic book. Perrenoud, P. (2002). A prática reflexiva no ofício de professor: Profissionalização e razão pedagógica. Porto Alegre: Artmed. Ponchirolli, O. (2007). Capital Humano – Sua importância na gestão estratégica do conhecimento. Curitiba: Juruá. Polanyi, M. (1967). The tacit dimension. London: Routledge & Kegan Paul. Popadiuk, S., Franklin, M.A., Vidal, P.G., Miguel, L.A.P., & Prieto, V.C. (2014) Exploitation e exploration do conhecimento organizacional: Uma análise em empresas brasileiras. In J.F Rezende (Org. ), Gestão do conhecimento, capital intelectual e ativos intangíveis: Teorias, métodos e debates sobre a geração de valor nas organizações contemporâneas. Rio de Janeiro: Elsevier. Rocha, A.F, & Rocha, F.T. (2011). Neuroeconomia e processo decisório. Rio de Janeiro: LTC. Schumpeter, J.A. (1934). The Theory of Economic Development. MA: Harvard University Press. Setzer, V.W. (1999). Dado, Informação, Conhecimento e Competência. Data Grama Zero - Revista de Ciência da Informação, 0. Retrieved from: http://www.dgz.org.br (Last access date: September, 2016). Stewart, T.A. (1999). Capital Intellectual. A nova Vantagem Competitiva das Organizações. Rio de Janeiro: Campus. Sveiby, K.E. (1998). A nova riqueza das organizações: Gerenciando e avaliando patrimônios do conhecimento. Rio de Janeiro: Campus. Sveiby, K.E., & Lloyd, T. (1987). Managing Knowhow. London: Bloomsbury. Takeuchi, H., & Nonaka, I. (2008). Gestão do conhecimento. Porto Alegre: Bookman. Von Krogh, G., Ichijo, K., & Nonaka, I. (2001). Facilitando a criação de conhecimento. Rio de Janeiro: Campus. Wilson, E.O. (1999). Consilience: The unit of knowledge. New York: Vintage Books. Yamaoka, E.J., Carvalho, I.M., & Gauthier, F.O. (2012). Taxonomia Corporativa e Aprendizagem Organizacional: Caminho para a Ambidestria. Anais do Simpósio sobre la Sociedad de la Información, SSI, 10. Yin, R.K. (2005). Estudo de caso: Planejamento e métodos (3ª ed.). Porto Alegre: Bookman. VIII - develop capacity to carry out consulting in management and administration, and skills to report and advice on administrative, managerial, organizational, strategic and operational issues.